Martin Gardner.org – Martin Gardener is no longer with us, but his incredible work lives on with this site. You can get to know him via the information on this site. NPR: Martian Gardener A Genius Of Recreational Mathematics – Read or listen to the interview about Martian Gardener. You can listen to the short interview if you click on the arrow in the upper left hand corner of the page. Age of Puzzles: Boris Kordemsky – Read the biography of a master puzzle maker who specialized in creating nonword puzzle books. University of Calgary: Charles Trigg – A bit of information about a man who is considered one of the foremost recreational mathematicians of the twentieth century. Puzzles.com: Charles Trigg – Hexagon-Circle-Hexagon – Solve one of the puzzles he created. Scott Kim.com – Modern day puzzle creator, computer game designer, and author. Read or follow the blog of Scott Kim. Peter Winkler: Games People Don’t Play – Article PDF Offers a compilation of thinking games. 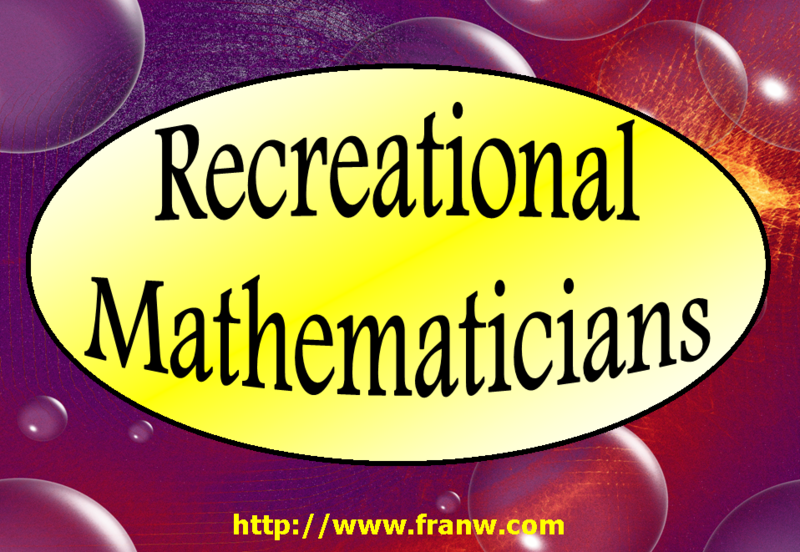 For the rest of this series please visit my Recreational Mathematics post.